Many students travel long distances after graduating college to take the next step in life. Few will travel as far as Catherine Witt, who will undertake a 7,371-mile journey to enter graduate school at the American University of Beirut in Lebanon. At the University of Arizona, Witt triple-majored in linguistics, Arabic, and Middle Eastern and North African studies. She plans to continue her education in public health, with a goal of working with refugee communities and camps on early childhood health and wellness, as well as sexual and reproductive health. "'I'm really passionate about humanitarian aid work, especially with refugee communities," said Witt, who began her Arabic language learning in high school when she participated in one of the National Security Agency's STARTALK Arabic summer camps. She chose to attend the UA because of its distinguished Arabic program and the Arabic Flagship program that debuted her freshman year. Through the UA Center for Middle Eastern Studies, Witt was awarded two Foreign Language Area Studies fellowships to study Arabic. "This is a great achievement," said Julie Ellison-Speight, CMES assistant director and current FLAS coordinator. FLAS fellowships are intensive language fellowships in Arabic, Hebrew, Persian or Turkish, available during the summer or the academic year. Witt received the award for summer 2015 and for the 2015-2016 school year. "I got to study Arabic in Morocco," Witt said. "I got an entire year's worth of Arabic in one summer, which was crazy. We had studies from 9 to 6 over the summer. Some of the classes were news media, formal Arabic and Moroccan." Witt's time in Morocco coincided with the month of Ramadan, the Islamic month of fasting in which people refrain from eating and drinking from dawn until after dusk. Learning the language and culture in such an immersive environment allows for opportunities that are not possible elsewhere. "I was able to go out for ice cream at 2 in the morning, and it was normal," Witt said. "Families, everyone was out because during Ramadan the city comes to life at night. It was amazing how everyone is able to synchronize and shift their lives to fit on such a large scale for the whole month." Witt also was able to explore the vast history of Morocco, from visiting leather tanneries in the ancient city of Fez to playing in the ruins of Volubilis (Walili). She learned a new way of life. "You see little 7- to 8-year-olds playing soccer on the other side of the city who walked there by themselves," Witt said about the high level of trust and safety fostered in local children. She also grew in confidence, assertion and respect. "You walk into a shop and there are no lines. Everyone just walked in and knew when it was their turn or socialized to find out," Witt said. "I had to adapt and stop standing there waiting for the store to clear out so I would know it's my turn, because there were no lines. You have to put yourself out there so people can see you." 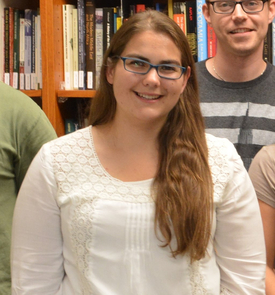 Witt's second FLAS fellowship continued her Arabic studies on the UA campus. "Fifth-year language is not grammar and conversation — it's literature analysis and presentations," Witt said. "Professor Sonia Shiri pointed out that one of the things the summer program did is make me a more confident speaker." A FLAS fellowship is a Department of Education fellowship aimed at assisting meritorious undergraduate students and graduate students who show a level of financial need and are motivated to learn modern foreign languages and related areas of international studies. "Because linguistics is a nontraditional undergraduate background for a public health master's degree, receiving these fellowships from CMES really helped me demonstrate to the American University of Beirut my motivation for advanced academic study," Witt said.